By changing only the playback timing of a motion sequence, an animator can achieve a variety of effects that alter our perception of an event. In some scenarios, it may be important to consider physical properties of the motion when retiming (e.g., to preserve physical plausibility). However, existing retiming solutions can be quite time consuming when physical parameters are considered. This paper presents an interactive method for creating optimal motion retimings that takes into account physically based constraints and objective functions. 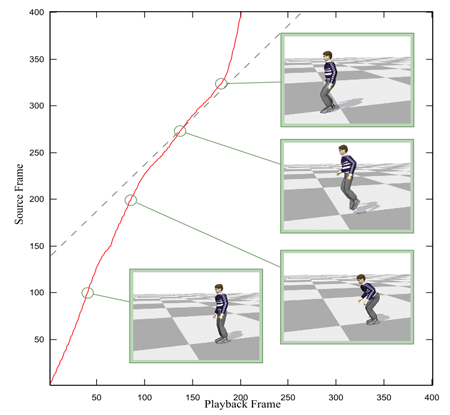 We achieve fast performance through a precomputation phase where constraints are projected into the two-dimensional space of velocities and accelerations along the input motion path. Unlike previous approaches, our precomputation technique allows for rapid computation of plausible contact forces that result from retiming, and it also accommodates changing physical parameters. We demonstrate our approach by creating physically plausible results for changes in motion duration, manipulations of the gravity vector, and modifications of character limb masses. James McCann, Nancy S. Pollard, Siddhartha S. Srinivasa (2006). Physics-Based Motion Retiming. 2006 ACM SIGGRAPH / Eurographics Symposium on Computer Animation.